M.O.H. @.L.Y.I.C.S ©: 601) Fawazeer Ramadan ::: The Street Sign ! 601) Fawazeer Ramadan ::: The Street Sign ! El Fazoura: Can you figure out the relation between the 2 signs? This is nice translation, LOL! lol ana mesh 3aref ageeb ay haga essara7a. 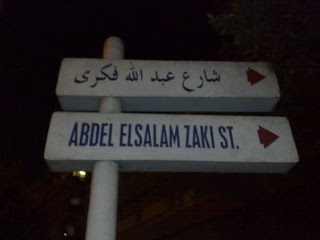 they are of the same street, sa7? we have lots of people getting it partially right like Brownie, Batabeet (maskhara),...etc. but I think INJIS is the winner as she got it all. By the way welcome to the blog. I'm loving the Ramadan Fawazeer! we tab3an el kalam dah beyfakarny be gomla mashhora Es7a leloon " Wake up to the color ya brother"
609) Being Yourself ::: Episode 2 - Part 2 ! 608) Being Yourself ::: Episode 2 - Part 1 ! 607) The Certainty about Virginity! 606) Fawazeer Ramadan ::: First Post ! 605) Fawazeer Ramadan .... The Losers win! 604) Fawazeer Ramadan ::: Three Decades ! 603) Fawazeer Ramadan ::: Wife's Birthday! 602) Fawazeer Ramadan ::: Felous El 7okoma! 600) Tribute to Life & Death; Tooti & Didi ! 599) Fawazeer Ramadan ::: SomeOne ! 598) Fawazeer Ramadan ::: Wrong Number! 545) Watch out for what you give women!! 742) Muslims & Christians: Merry Christmas 2011 ! 846) Miss Egypt ... Kaman we Kaman we Kaman !! 785) Sexual Compatibility & Marriage ! 803) Naguib & Mahfouz ! 777) Seven Seven Seven !! 764) I will GO and say NO ! Mohamed Aly A.Fattah, Mohaly, Egypt 2007-2010. Awesome Inc. theme. Powered by Blogger.